I am currently in the process of deep cleaning and reorganizing my sewing room. Amazing the treasures I am uncovering in the process! This hand embroidered dish towel is one item finally seeing the light of day after years in a dark drawer. Being almost Easter, the little bunny and his carrot especially caught my eye. Please pardon the wrinkles. I was cleaning, not ironing! Sorry to say that I do not know who stitched this little gem. I do remember it being in the kitchen as I grew up. 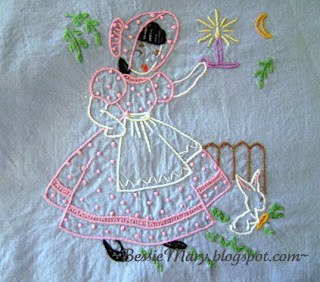 We had similar ones that aunts and grandmothers on both sides of the family stitched. It came to live with me several years ago when I helped Daddy moved out of my childhood home. What struck me most was how simple all the stitches are. 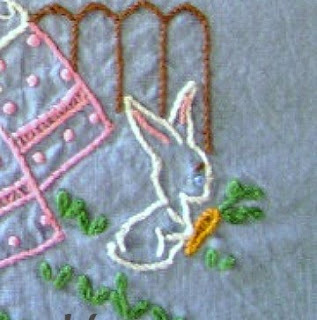 It uses only the very basic stitches: outline, french knots, lazy daisy and a few straight stitches here and there. Often, I get bogged down with overthinking a project. Do you? This proves that delightful embroidery and stitching projects are attainable for all of us. You do not need to know how to make perfect bullion roses or other complex embroidery stitches. It also shows that hand embroidered pieces can be used, loved, and used some more. Instead of thinking so much, maybe we just need to stitch a little more. There are times that more attention to details is a good thing: coming home from the hospital gowns, angelic christening gowns, birthday and holiday finery, Holy First Communion dresses and wedding gowns. In between all of those, there are so many opportunities for simple stitches. We just need to seize the moment with needle and thread! I am working on a tutorial for ribbon rosettes and other bonnet streamer attachments. Be back soon! what a precious piece!!! I agree, simple is sometimes infinitely better!!! I can't wait to see your rosette tutorial!!!! I just love those!! So sweet! I am also cleaning and organizing all of my sewing stuff!!! I have come across some things like this. 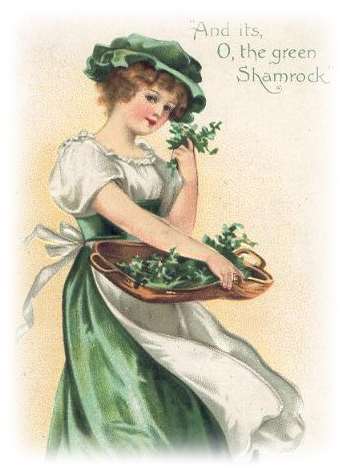 I have so many heirloom things, some that were in my family and some that I've bought. I had forgotten many of them. One needs to clean out every now and then just to know what one has!!! I do over think often! What a sweet treasure. I like that the bunny is out and about but she needs a candle to see. How fun that you found this while organizing your stash. How sweet!! Love the simplicity of it. 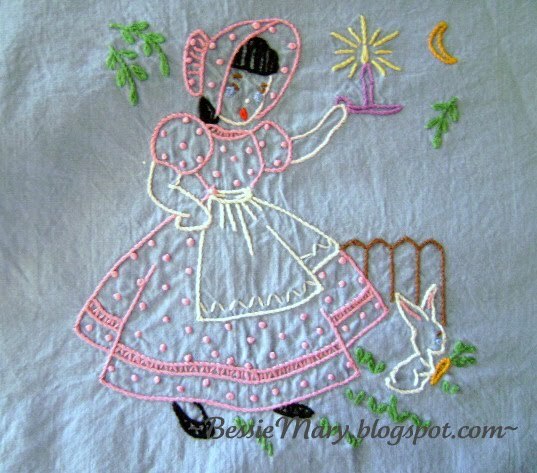 I have some embroidered cloths in my sewing room, albeit not as nice as this one. Mine are cutter ones if I ever get up the nerve. Something that pretty should not be hiding in a drawer! Good luck with your cleaning and sorting.